Corbin Donais celebrates with spectators during a lunchtime Volleyball game. 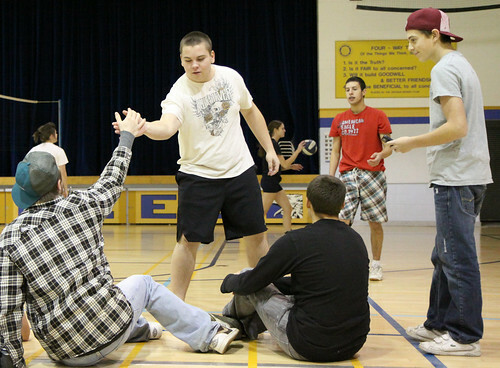 As part of their course work, Mr. Lalonde’s Phys-ed classes have been running lunchtime intramural sports activities. Students have signed up teams for basketball and volleyball, and over the last few weeks have been playing lunchtime games. Today was the final day of four on four volleyball, with the playoff day set for December 17th. Thanks to Mr. Lalonde’s class for organizing these great activities!